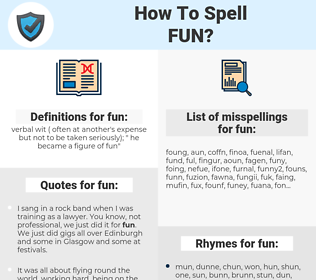 What are the misspellings for fun? What are the common mistypes for fun? 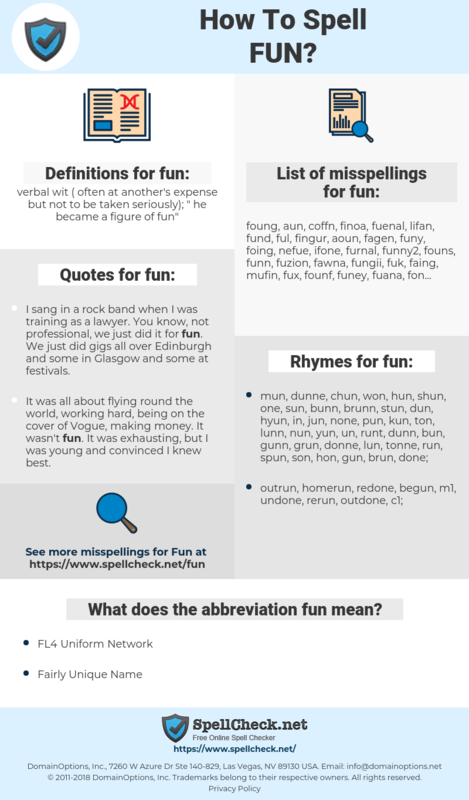 What does the abbreviation fun mean? What are the usage examples for fun? What are the quotes for fun? What are the rhymes for fun? What are the translations for fun? What are the common typos for fun? verbal wit (often at another's expense but not to be taken seriously); "he became a figure of fun"
This graph shows how "fun" have occurred between 1800 and 2008 in a corpus of English books. A three year old child is a being who gets almost as much fun out of a fifty -six dollar set of swings as it does out of finding a small green worm. leuk, plezier, lol, vermaak, grappig, plezierig, speels, vermakelijk, tof. placer, prêt, ludique, plaisant, sympa, divertissant, plaisir, chouette, divertissement, marrant, rigolo, amusante, amusants. heiter, komisch, Freude, ulkig, legal, munter, lustig, Gaudi, Witz, witzig, freudig, Unfug, Heiterkeit, Scherz, spielerisch, Fun, Gag, Jux, Amüsement, Frohmut, Schabernack, Belustigung, Ulk, Kurzweil, Schelmerei, Jokus, Hetz, spaßig, vergnüglich, unterhaltsam, amüsant, fidel, erheiternd, launig, kurzweilig, scherzhaft, belustigend. 楽しい, ファン, たのしい, いっきょう, 一興, 娯しい, 愉しい, たわむれ. divertida, diversão, brincadeira, lazer, prazer, divertidos, divertidas, lúdico, animados, descontraída, animação, entretenimento. esparcimiento, alegría, diversión, divertido, entretenido, ameno, gusto, entretenimiento, gozo, recreativas, cachondeo.